I can still remember that fleeting feeling of peacefulness that swept over me as I rode along in the car through the hills of Ireland. Fog was drifting across the mountains, sheep gathered along the wooden fences, a house, cobblestone, sat not too far away from the sheep. Smoke curled out of the chimney. Tea time. There were scones, I imagined, under the roof, behind the cobblestones. A man, coming in from the cold, hangs up his rubber jacket, and removes his boots, while his wife pours the tea. Nourishment for the belly, a soothing balm for the nerves. This is what I think about as I make my first batch of Beet Kvass. It’s an elixir — a tonic — used in Europe, with amazing health benefits. Normally, I probably would have just passed the recipe by, savored the story of its thousand-year heritage of fermentation, and it’s healing affects on the body. More curiously, wondered at the amazing ability of each culture to develop its own “tonic” to match its own vegetation. Sauerkraut, fermented — not the kind in the jar at the grocery store — from the Germans. Kimchi from the Koreans. Yogurt from Bulgaria. They all have active cultures the body needs. I am mildly annoyed, (but still grateful for her), that my doctor’s nurse practitioner calls me each week to report to me that my recent blood test has revealed an unacceptably low hemoglobin. Is this why it’s so hard for me to run? I’m intrigued with beets in their ability to help me work through this body’s cry for help. Raw beets are used by runners to help them build stamina, as they are loaded betacyanin which can dramatically increase the oxygen-carrying ability of the blood. A study in UK found that after six days of drinking 500 ml of beetroot juice, drinkers could exercise 25% longer than when talking a placebo. The secret is in the nitrates that reduce the energy costs associated with low and high intensity exercise. I’m not interested in running longer. I’m interested in beet’s iron. Beets are an ancient remedy for treating anemia. The high content of iron in beets is easy for the body to absorb, as it regenerates and reactivates the red blood cells, leading to adequate supply of fresh oxygen to the body. 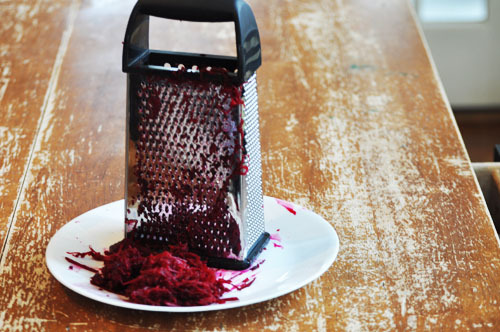 I’ve been eating beets raw, grating them, to get the highest nutritional benefit. As long as there is plenty of vinegar and feta and salt — it’s delicious. 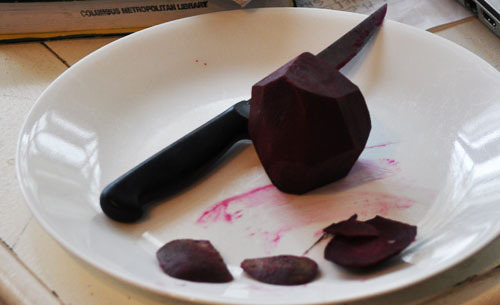 Beets are not as hard as a rock. I just cut off the peels, and grate them with a hand grater. 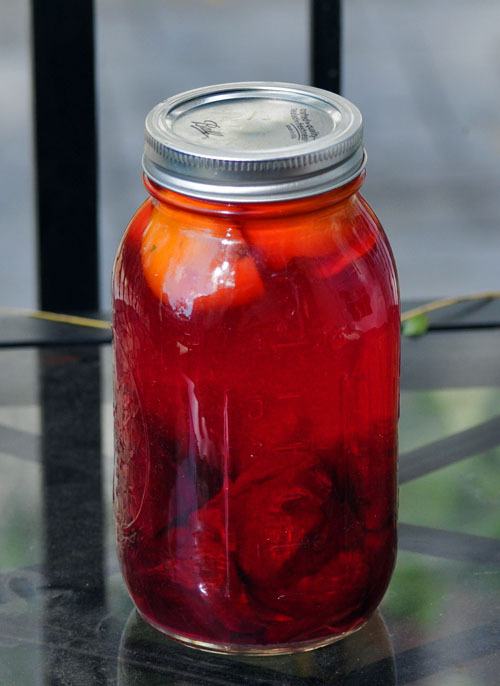 Now my attention has turned to Beet Kvass — that ancient tonic I mentioned earlier. You could read all you want about fermentation all over the Internet. I did that. Spent days reading, instead of making the kvass and getting on with it. I was afraid I’d do it wrong.. I studied the instructions again and again. Wash, peel and cut the beets into cubes. Toss them into a quart jar. I added a couple of sliced tangerines, and a couple slivers of ginger. Add 1 tablespoon of Sea Sat. Store in a dark place for two days, then transfer to fridge. I think it’s OK to drink at that point — but the longer it sits the better. I’ve read up to 3 weeks. I am not sure how long it will keep… more research in order. 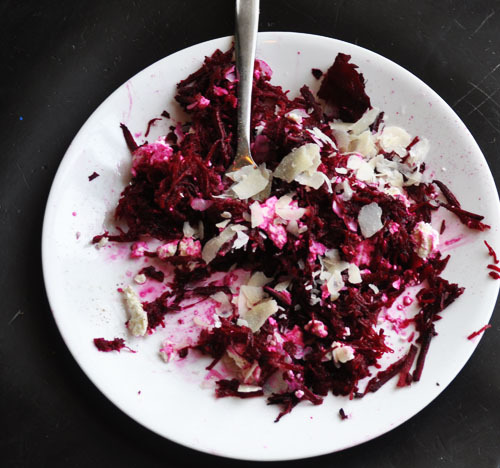 Until it’s ready to drink, I’ll be eating my fresh beet salad… daily. There is something comforting about having this jar of Kvass waiting in my pantry for me. It’s almost as if I didn’t make it alone — made instead by those thousands years of healing tradition, reaching out to me here, to make this nourishing elixir. Much like those houses in Ireland, with all those stories, shared over a cup of nourishing tea.